Last night, was another sleepless and restless night. I don’t know if it was from my minor binge or if its because I had coffee later in the day, or if its because my mom and I are still on the rocks. Either way, I laid in bed for hours last night, just thinking about my upcoming day trip to seaside tomorrow… stressing about what I’m going to eat. I know I get excited over really trivial things, but yesterday my new scale came! I’m not sure if I shared with you that my food scale died on me last week. 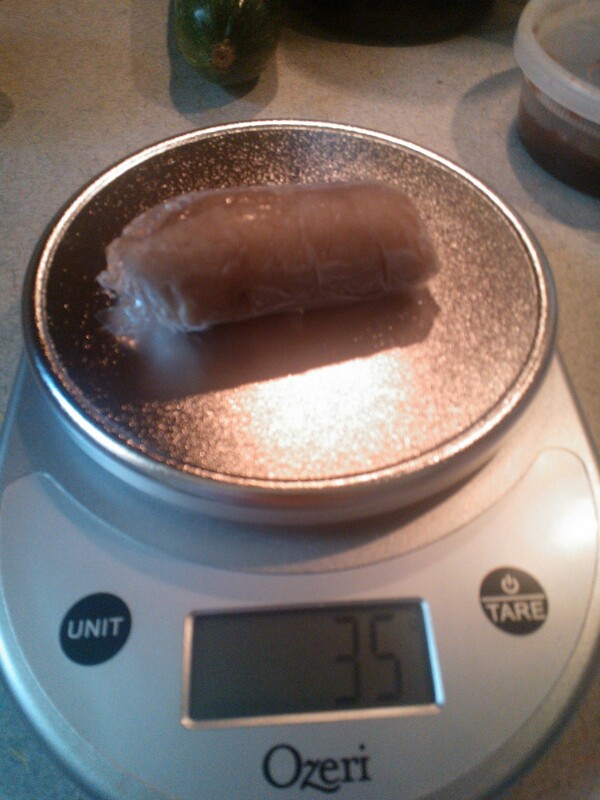 To test it, I put a baby carrot on it and it said it weighed like 805g! I don’t think so! After a trial of changing batteries, ensuring I was using a level surface, and weighing a bunch of random items, I had to accept that the scale was no longer working. RIP scale. You have been good to me. 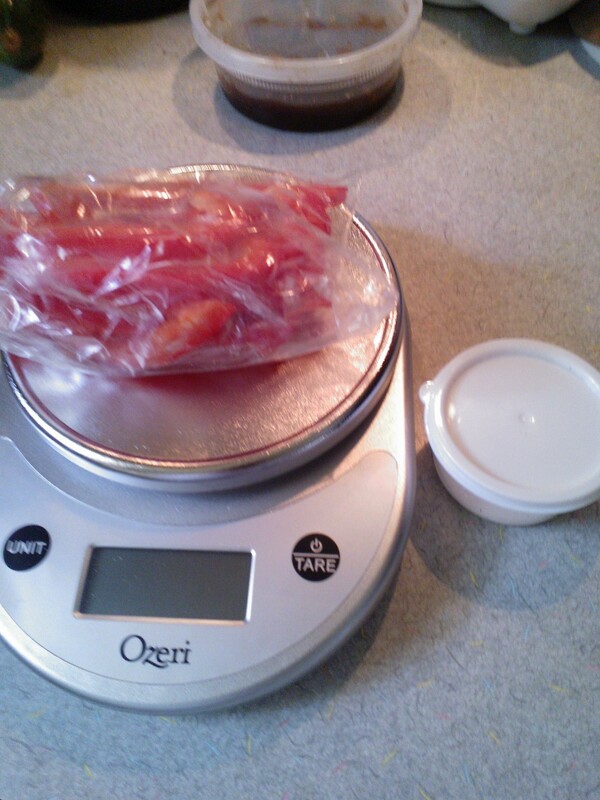 I ordered a new scale off cooking.com and lucked out when I saw it was on sale! Yesterday, a brown box arrived with a cooking.com sticker. “It’s here!! !” According to Barry, my excitement was quite amusing! 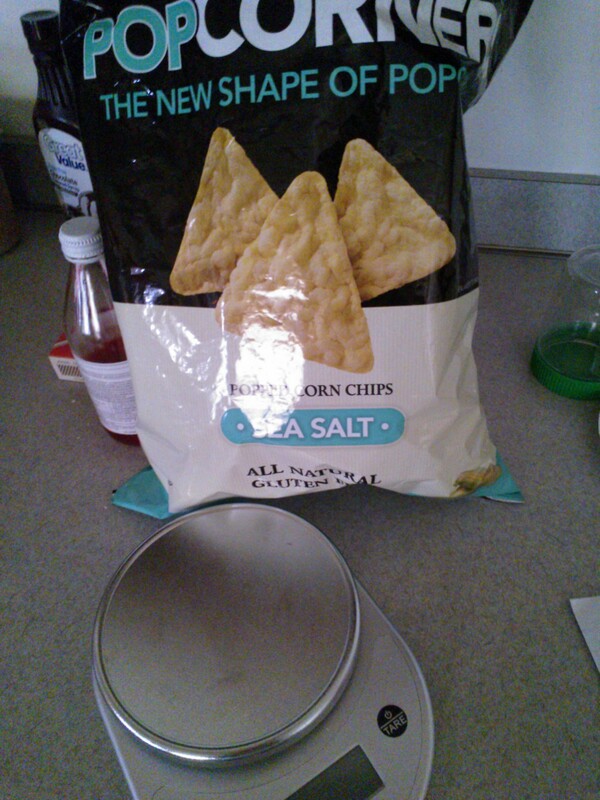 I was so excited to actually see how many Popcorners actually equaled an ounce! 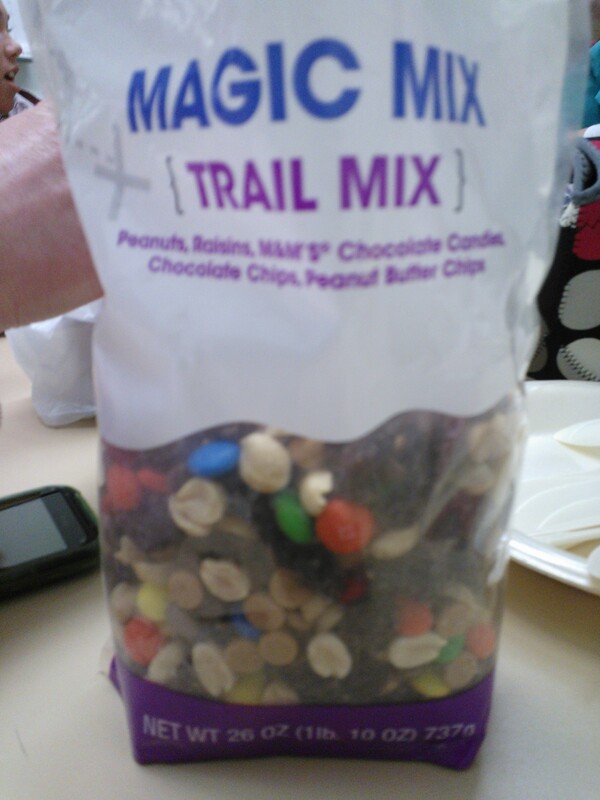 Yesterdays free sample from the pet store was an item I had never seen. I thought, initially it was a dog treat, but after further reading, it turned out to be actual dog food… freeze-dried dog food! Beauty loved it! The product is called Stella & Chewy’s. Beauty had the Stella’s Super Beef Dinner. They also make cat food, which I’ll have to try for Bunny. What I really liked about this product was that the first 6 ingredients actually were BEEF, followed by real ingredients like spinach, beets, pumpkin seeds, and cranberries. There are also frozen products and pet treats, as well as a nifty calculator to determine how much food your dog or cat will require based on weight, activity level, and type of food. To add to the already cool concept of freeze-dried pet food, Stella & Chewy’s donates a portion of their profits to no-kill shelters and animal rescues! *Please know that this review is NOT sponsored my Stella & Chewy’s in any way. As I told you yesterday, I like fruit in my shakes, and I cannot lie! I used my new scale to weigh out everything today! 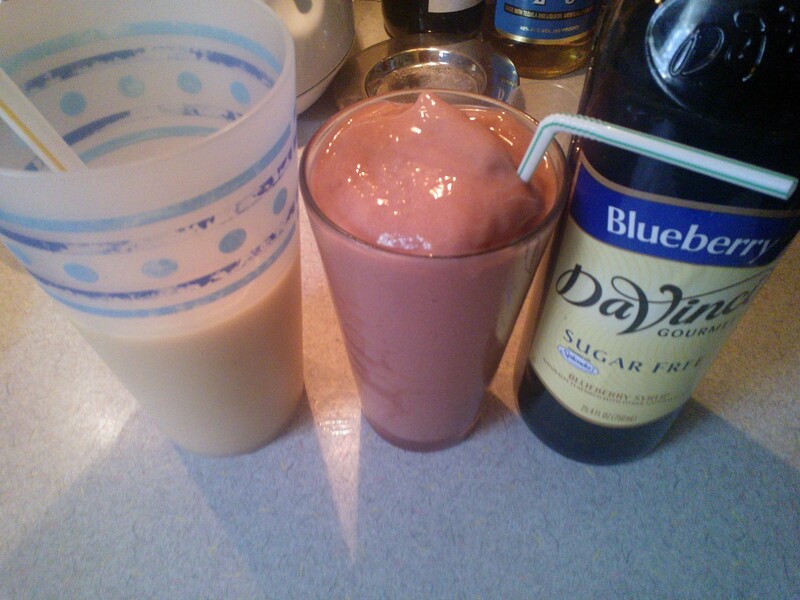 First, was the banana for my Blueberry Banana Latte shake. Frank’s shake turned out super delicious! I threw a bunch of frozen cantaloupe and some frozen mango in with vanilla shake mix! 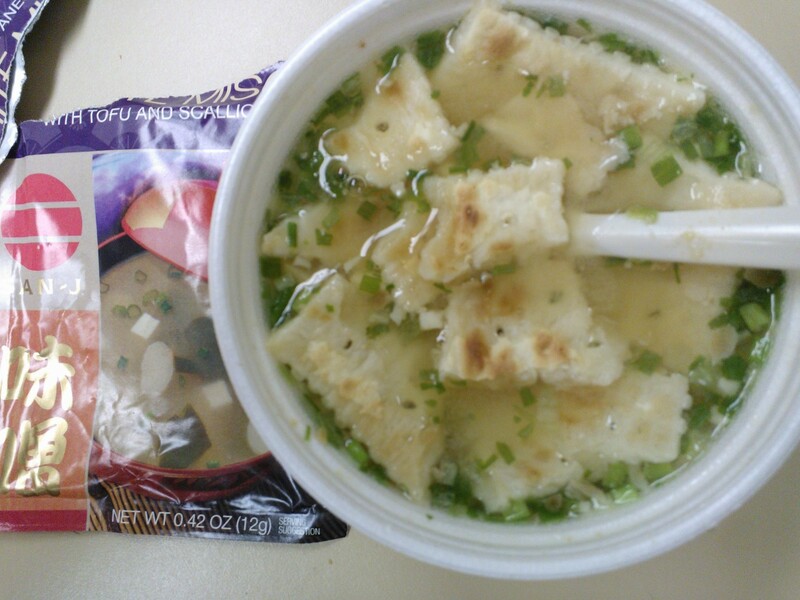 Although the little binges do not help, my eating has been decent otherwise. 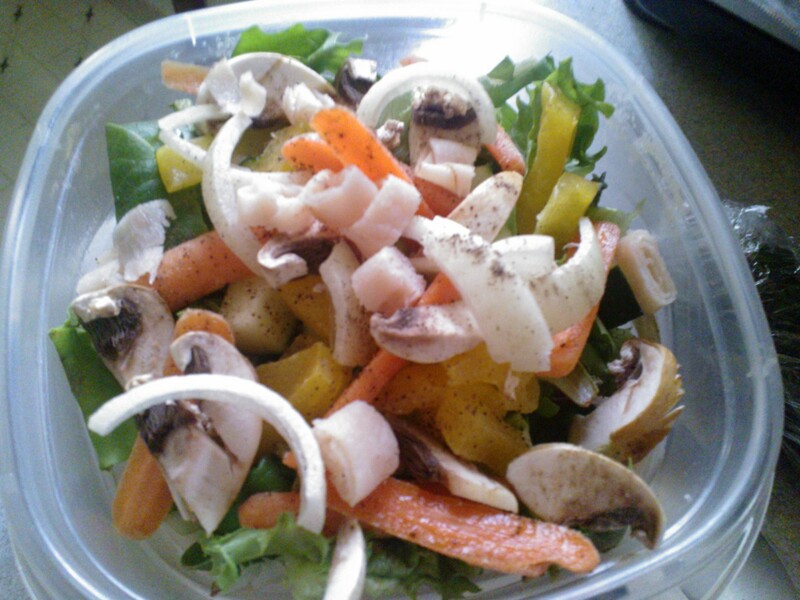 My diet has been full of fruits and veggies lately, too! One of the many pros of warm weather is fresh produce! I was back at work tonight. Dinner was simple and in the form of a hot pocket-esque burrito: Amy’s Tofu Scramble in a Pocket Sandwich. My past experience with tofu scrambles is that they require a decent amount of seasoning, so just in case, I brought some chili powder and crushed red pepper flakes to work with me. After last night’s snack attack, I wanted to be prepared, so I also sliced half a bell pepper and brought it to work with some Walden Farms dressing for dipping. I decided to head back to the pet store to grab Beauty a bag of the new dog food, see what all the hype was about with this Blue Buffalo stuff, and grab Bunny a sample of Stella & Chewy’s to try. The cat enjoyed her Heavenly Herring and Tuna, and Beauty scarfed down her small can of Wellness, as she always does. 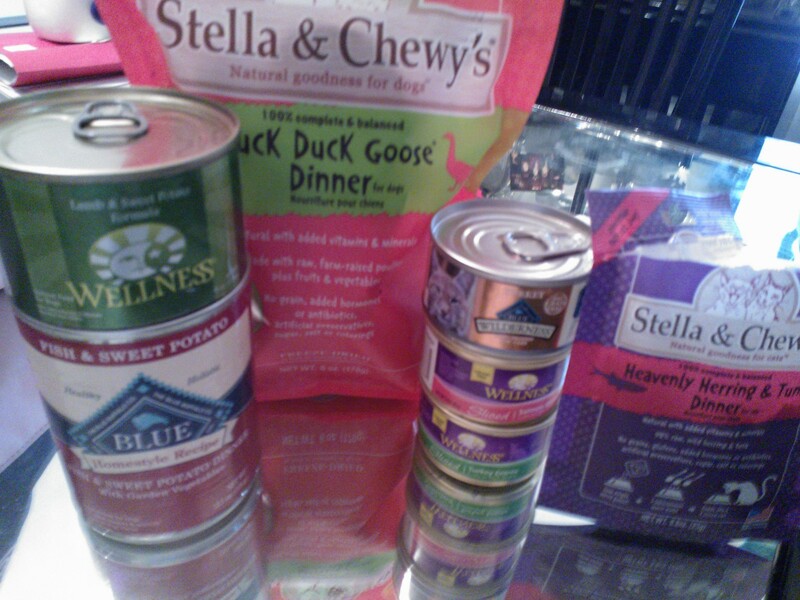 I like Wellness food for her because like Stella & Chewy’s the first ingredients actually are meat! In the past, Beauty has really enjoyed the Turkey & Sweet Potato and the Venison & Sweet Potato. This morning, I mixed half of the small can of Duck & Sweet Potato with her dry food. On this visit, I grabbed the Lamb & Sweet Potato, as well as S&C’s Duck, Duck, Goose freeze-dried patties. As for Bunny, I recently tried him with Wellness food, and he, too, ate his bowl clean. The canned cat food happened to be on sale (woot, woot)! I’ll let you know about the Blue Buffalo. I definitely would agree that the dry food is too expensive! It amazes me some of the food combinations that companies have for animals. I don’t believe in spending a fortune on pet food, but I do believe that my animals are my family and should be treated as such. I’m glad that there are companies that feel the same, and create foods to nourish our babies! I came home and devoured my sliced bell pepper! I was so hungry. Barry stopped by before he headed off to work, and Frank and I began to assemble our dinners. Since I was home, we sprinkled a salmon fillet with some adobo and baked it in the toaster over. 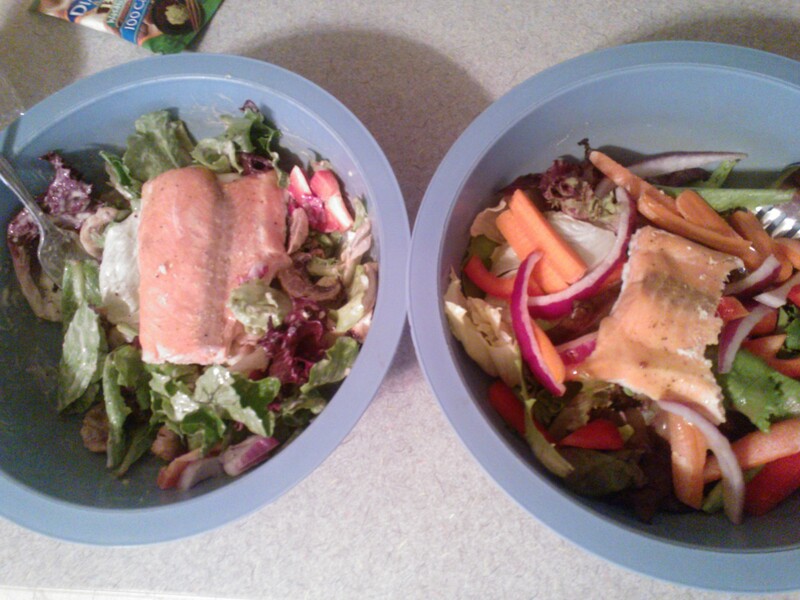 We both created a spring mix salad, mine with peppers, carrots, and onions, a piece of the salmon fillet, and a drizzle of fat free Honey Dijon. Frank kicked it Ceasar-style. Meanwhile, work called to bring me in at 7pm. I was not too apt to drive back to work since I had just arrived back home from there. After a discussion with the supervisor, we worked things out and I was able to stay home for the night. Now, I can go to bed early to prepare for tomorrow, do some laundry, study, and relax, plus I already picked up extra shifts for the week! I’m thankful things worked out! You know that feeling you get when you check Facebook, and you have a new friend request, or when someone invites you to an event, or when you get a new follower on Tumblr. I had that feeling waking up this morning. I received two emails from wordpress.com, the host site of Be Well Bundo. One stated that a person liked “Everyone Needs Cheerleaders” and the other, that I had gotten a new follower. Naturally, I get curious about these people and return the favor of checking out their blogs. Both people were using blogging to help cope with their eating disorders, one with anorexia, and the other with bingeing and bulimia. I read through some of their posts, recognizing their feelings and sentiments, remembering being in those similar situations, trying to find ways out. Its the little things like that, that make me smile. Knowing that through our blogs, we not only help each other, but ourselves. We have outlets, validation of our feelings, knowing we are not alone, and most importantly, making new friends and contacts to be our cheerleaders in the fight.